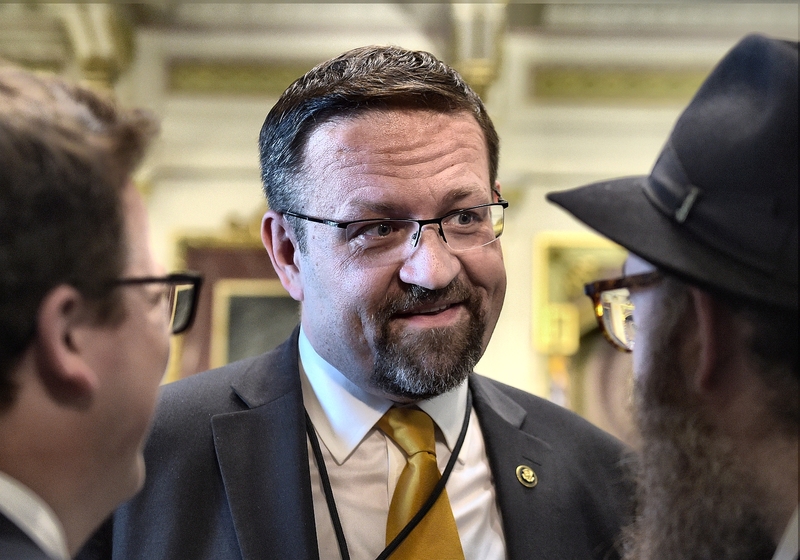 During the decade and a half Gorka spent in Hungary, he was enmeshed in a web of ultraright, anti-Semitic and even Nazi-like parties, politicians and media outlets. For most of the 2000s, the Gorkas ran a think tank in Budapest called the Institute for Transitional Democracy and International Security (ITDIS). For funding, Gorka received at least $27,650 in U.S. federal grants, according to government records. “We worked for ourselves,” Katharine Gorka tells Rolling Stone. Yet these denials are hard to square with Gorka’s family background. Having fled Hungary for London after 1956, Gorka’s parents joined a raucous mix of anti-Communist, right-wing exiles, including those who belonged to the Order of Knights (Vitézi Rend), an organization with an unsavory past. Vitézi Rend was created by the Nazi-backed ruler of Hungary, and many of its members were involved in the slaughter of Jews during the Holocaust. Today, members of the Order fall under an immigration watch by the State Department on groups that have violated human rights. Gorka and his father were reported to have joined (Katharine says this is false). And in photographs, Gorka has been spotted sporting a Vitézi Rend medal that, he insisted, he wore only to honor his father. Since this affiliation was exposed by The Forward, Gorka has been engulfed in a storm of criticism, with members of Congress writing the White House to demand that he be fired. “Our main concern is that Dr. Gorka is a member of certain anti-Semitic Nazi groups such as Vitézi Rend,” says Rep. Jerry Nadler, a New York Democrat. “There’s a lot of evidence that he was a member: He swore a lifelong loyalty, he’s used the honorific initial v., he’s been photographed with some of their insignia.” So far, Nadler and his colleagues haven’t heard back from the White House.